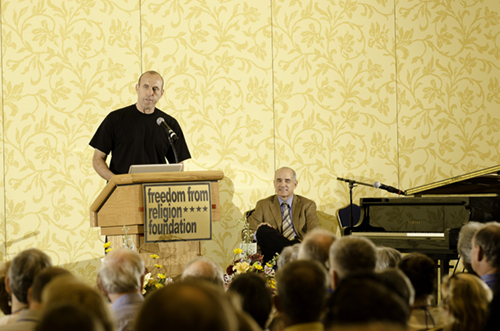 Last month the Freedom From Religion Foundation put a printed edition of my presentation at their annual convention in Hartford, CT in their newsletter. For those who are not members and who do not have access to the newsletter (which alone is worth the price of membership in the organization) the printed transcription is now available on their website here. For those who would like to hear the whole thing, the complete audio from the talk, including music I used in it has been available for some time and I posted a link to it here. My thanks to Dan Barker, Annie Laurie Gaylor and their staff for their hospitality and good work. I will have some more news on upcoming projects with Dan and the Foundation before long. Stay tuned! This entry was posted in Freethought and tagged Agnosticism, annie laurie gaylor, Dan Barker, Faith, Freedom From Religion Foundation, Freethought, Hell, Love, Lovism, Meaning, Science by ojotaylor. Bookmark the permalink.